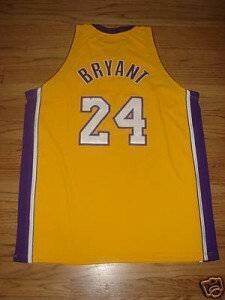 There is a great deal on game worn Kobe Bryant Jersey on ebay right now! Honestly I fully expect this guy to go to the hall of fame, so this Game Worn Jersey is a real steal at it’s current price on Ebay. The Jersey shows sign of wear and it should considering it’s being advertised as game worn. 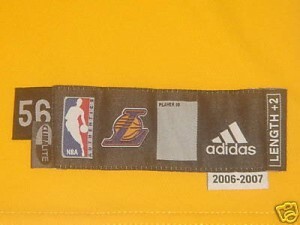 In fact this is one of the Jerseys that Kobe wore during the 06-07 season. This jersey without a doubt should be looked at as an investment quality Jersey and not something that you would wear to your next fantasy draft. The Black Mamba has 4 rings and just keeps on getting better, so when he hits the HOF don’t be surprised to see this same jersey going for over $8,000. This jersey comes with a letter of Authenticity from Vintage Authentics. My advice for the big fan is to buy this jersey and then get it signed and framed! This jersey could be a great centerpiece for any NBA fan’s man-cave or finished basement!